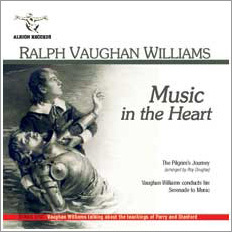 the death of Ralph Vaughan Williams on 26th August 1958. Vaughan Williams may not have had a conventional conducting technique but he achieved remarkable results. Now for the first time we can hear the gorgeous Serenade to Music conducted by the composer from a performance in 1951. It is a deeply expressive and romantic interpretation, using eleven of the singers involved in the original 1938 performance. The sound is sometimes a little congested but it is very listenable if you have any extensive experience of archive recordings … an invigorating performance. This music and performance are truly reflective of the authentic RVW spirit – that intensity of delight once described as ‘notable ecstasy’.